Botanical Name: Dicentra formosa Description: A low growing White Bleeding Heart that is quite suitable for groundcover applications. Fern like blue green foliage is topped with thin spikes of charming white flowers. 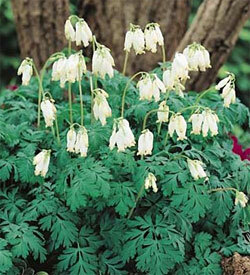 Aurora is an improvement over native White Bleeding Hearts, with more abundant flowers. It blooms heavily in late spring, and then continues to bloom occasionally throughout the summer, and heavily again in the fall. The plants grow best in shade and in moist soil, and have a nicely mounded form. We ship #1 grade root divisions that will get off to a quick, strong start. Order for your garden today.